Morton - The Chip's Challenge Wiki - The Chip's Challenge Database that anyone can edit! 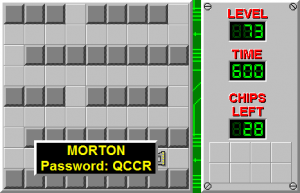 Morton is the 73rd level in Chip's Challenge 1. 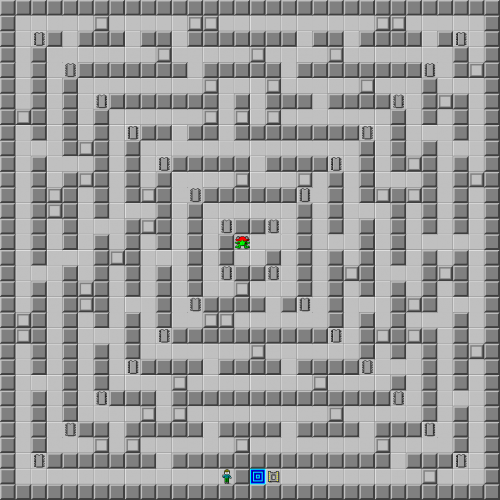 This level looks like a simple sort of maze, but is stocked with hidden walls that make this level a difficult challenge. The addition of a teeth in the center will make this level difficult to score the bold time on, but because routine revelation of the hidden walls also reveals a spot to trap the teeth, it is not as difficult to complete. Odd step is recommended. Collect the chips as shown, walking around the western corners and moving east from the far west edge, until "Morton" (the teeth) is visible at about 556. Lure Morton out on the south end and move east, then collect the chip in this corner only after the teeth steps R, as default teeth programming is to move U here if legal. Wait  and move D, then add another  to bring him inside the room and leave chip 4 in Morton's "lair" such that the teeth is held enough out of the way for Chip to then take the chip and escape. The teeth will try to follow and will escape eventually, but it will have to turn enough times, only after Chip traverses vast areas of the level, that it cannot harm him. Enter the inner southwest corner, then empty the northeast and southeast corners and move slightly west to the exit. The northeast corner contains an extra path across row 1 which allows Chip to trap Morton from a distance if desired: if the teeth has escaped, simply waiting at [14, 1] brings it around into a dead end at [16, 7] that traps it for good. The unofficial name of the teeth as Morton is from Morton Downey Jr., a talk show host whose talk show's logo closely resembles the original Lynx teeth.